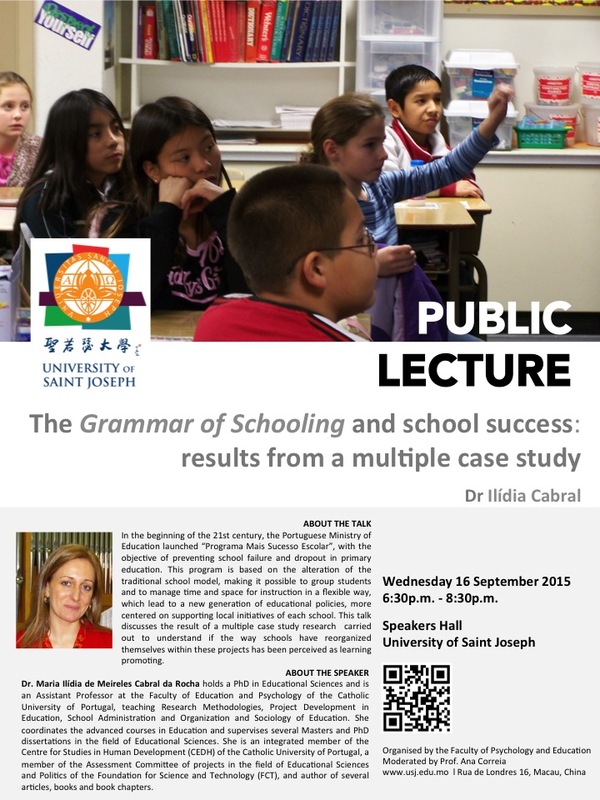 Public Lecture:The Grammar of Schooling and school success: results from a multiple case study on 16 September 2015 (Wednesday) by Dr Ilídia Cabral at Speakers' Hall. In the beginning of the 21st century, the Portuguese Ministry of Education launched “Programa Mais Sucesso Escolar”, with the objective of preventing school failure and dropout in primary education. This program is based on the alteration of the traditional school model, making it possible to group students and to manage time and space for instruction in a flexible way, which lead to a new generation of educational policies, more centered on supporting local initiatives of each school. This talk discusses the result of a multiple case study research carried out to understand if the way schools have reorganized themselves within these projects has been perceived as learning promoting. Dr. Maria Ilídia de Meireles Cabral da Rocha holds a PhD in Educational Sciences and is an Assistant Professor at the Faculty of Education and Psychology of the Catholic University of Portugal, teaching Research Methodologies, Project Development in Education, School Administration and Organization and Sociology of Education. She coordinates the advanced courses in Education and supervises several Masters and PhD dissertations in the field of Educational Sciences. She is an integrated member of the Centre for Studies in Human Development (CEDH) of the Catholic University of Portugal, a member of the Assessment Committee of projects in the field of Educational Sciences and Politics of the Foundation for Science and Technology (FCT), and author of several articles, books and book chapters.